Don’t know much about horses? No problem! 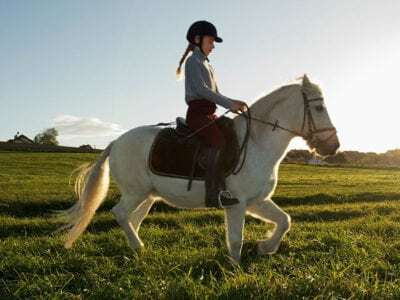 Time To Ride is here to help you find a local riding facility that will introduce your child to horses and horse care through a series of lessons at a Time To Ride Program Facility. To be designated as a Time To Ride Program Facility, both the barn and staff have to meet a stringent set of requirements and follow a curriculum designed to teach kids responsibility, patience, perseverance, and how to set and achieve goals, all while learning basic horse care and horseback riding. As with any new activity, the best experience is an informed experience. That’s why we’ve created some helpful information for newcomers. Looking For Horseback Riding Lessons? Time To Ride Program Facilities work with local schools, youth organizations and homeschool groups to offer a set of beginner group lessons for kids new to horses. Use our TTR Program Facility Map or check with your child’s school or youth organizations such as Boy and Girl Scouts, YMCA and faith-based groups to see if there’s a Time To Ride Program Facility in your area. Please note that we are conducting a pilot program in 2019 so TTR Program Facilities are limited. If you can’t locate a TTR Program Facility in your area and still want to check out riding lessons for your child, please visit the Certified Horsemanship Association (CHA) [http://www.cha-ahse.org/] or United States Pony Clubs (USPC) [ponyclub.org] to find an instructor or riding center. To get you started, here are 13 questions to ask when looking for a riding instructor, courtesy of CHA. From trail riding to jumping, reining to dressage and so much more, there’s almost no end to the fun you can have on a horse. Learn more about these magnificent creatures and the special relationship we’ve enjoyed with them for over 5000 years.